Sift: This was to remove really large particles. Slurry: Make mud and let it settle to let the coarse heavy particles settle at the bottom, and finest particles separate to the top. Drain: Duct tape, it works for everything! Dry: My own dried out mud puddle. Cool cracks, huh? Looks like almost all the breaks are three lines from a single point. 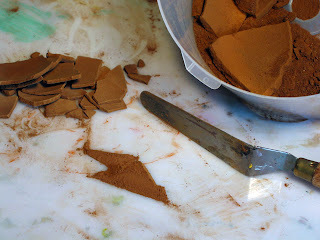 Separate: Found it was easiest to use a carving knife. 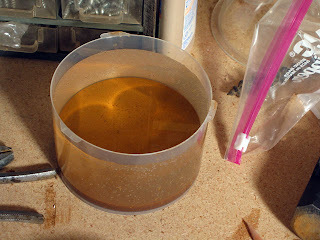 The coarse particles came right off, and the silt was harder, and actually carved pretty well. Too bad it’s so fragile, or I could sculpt with it. Crush: I didn’t use a mortar and pestle this time, but will on my next test batch. 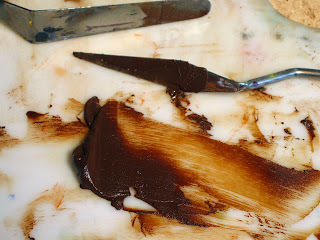 Mix with oil: Used M. Graham Walnut oil, and mixed it with a palate knife for about a half hour or so. Final paint: Not too bad considering I made it from my parent’s front yard dirt! 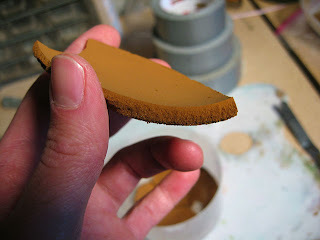 It’s still a little coarse, as it has the consistency of chocolate icing. 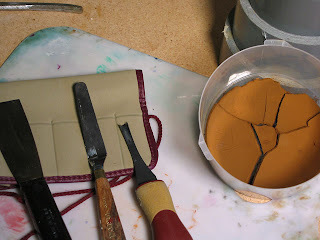 I’m going to do a slurry on the fine pigment to see if I can get better results. Still, better than ketchup. I ran magnet I found on a shopping cart (cow magnet being marketed as a kid’s toy) through the pre sifted stuff, and it picked up iron particles! 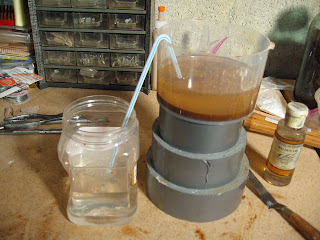 I’m going to try to isolate these, and rust them (maybe keep in water for a while?) 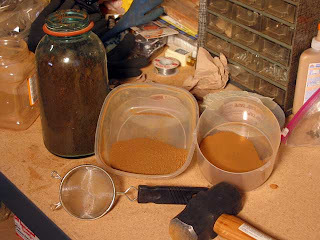 to get an iron oxide powder for a really deep red. 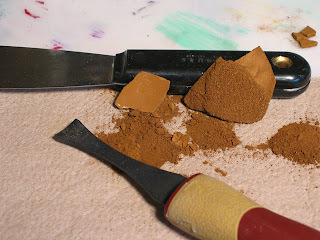 Firing the silt may create darker colors. I’ll have to try this sometime too. Next post: Details on how the canvas is coming.